The other day, I was preparing to receive a new friend in my home. She came to the United States from Cameroon two months ago so she is virtually new here. 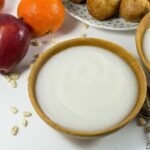 I was thinking of what I could cook that she would really like as a newbie whose taste memories of authentic Cameroonian food are still fresh. Then I thought of Njama Njama cooked in Egusi. Hummmm! Njama Njama is a green leafy vegetable that is scientifically known as solanum scabrum. Before cooking, the leaves and soft stems are picked from each main stem. They are then boiled without water or with very little water, depending on the softness of that particular Njama Njama. Most of the leaves tend to ooze out water when they come in contact with heat. After boiling, the vegetable is squeezed, and chopped into pieces that can easily fit into hungry mouths. Then the vegetable is either stir-fried with tomatoes and onions, simply tossed in palm oil or cooked with egusi (melon seeds), which is my favourite method. Njama Njama is typically eaten with corn fufu though you could also eat it with boiled cocoyams, boiled/fried plantains plantains or boiled yams. Many people least expect to find Njama Njama in America. I least expected to find it too. So how did Njama Njama get here? I was pleasantly surprised to find that the Hmong people from Asia farm this. I buy a huge quantity from them in the summer, them boil and freeze for consumption throughout the year. I’ll be buying some fresh ones this weekend and I’ll do a post to show you what the leaves look like when uncooked. If you can’t find Njama Njama, also known as huckleberry, water cress and kale are good substitutes. 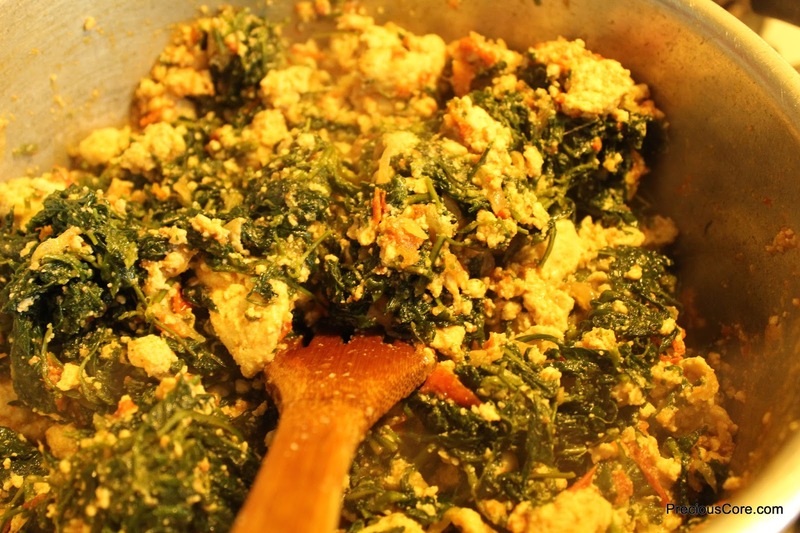 You can even substitute with spinach.Whatever you do, don’t be left out of the sizzling goodness of vegetable cooked in egusi. 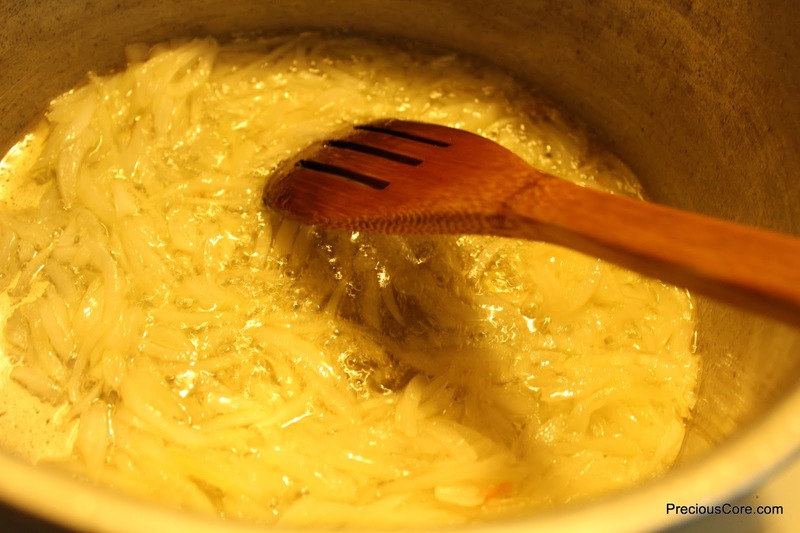 Heat the vegetable oil in a pot and add in chopped onions. Add chopped tomatoes and saute. 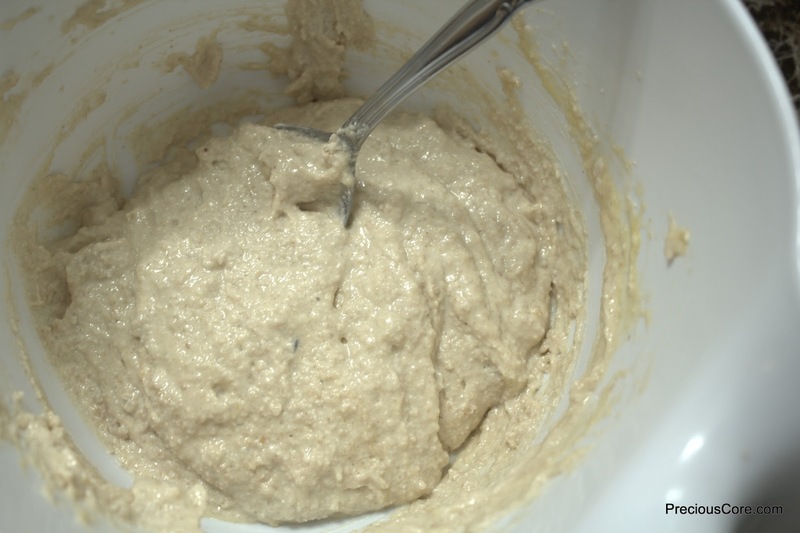 While that fries, add half a cup of water and a pinch of salt to your egusi and mix to a paste. 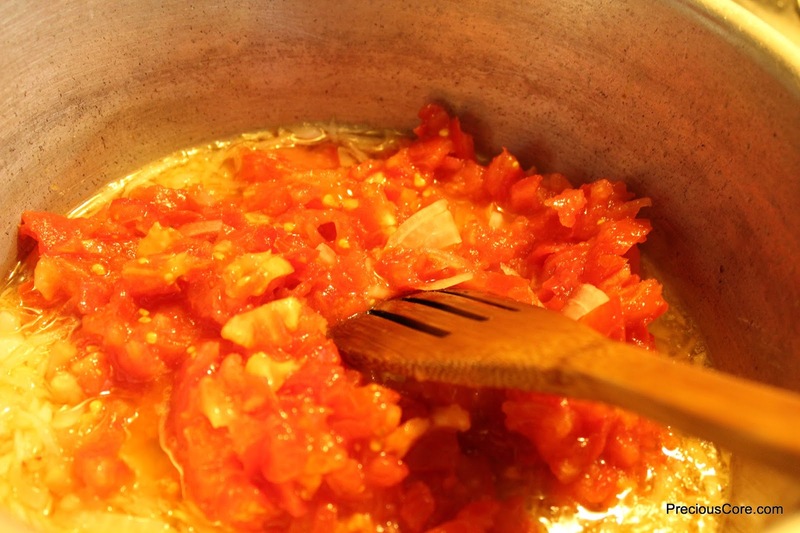 When the tomatoes are fried until they no longer taste sour, add ground garlic, ginger and pepper, if using. Also add your maggi cubes and salt at this point. 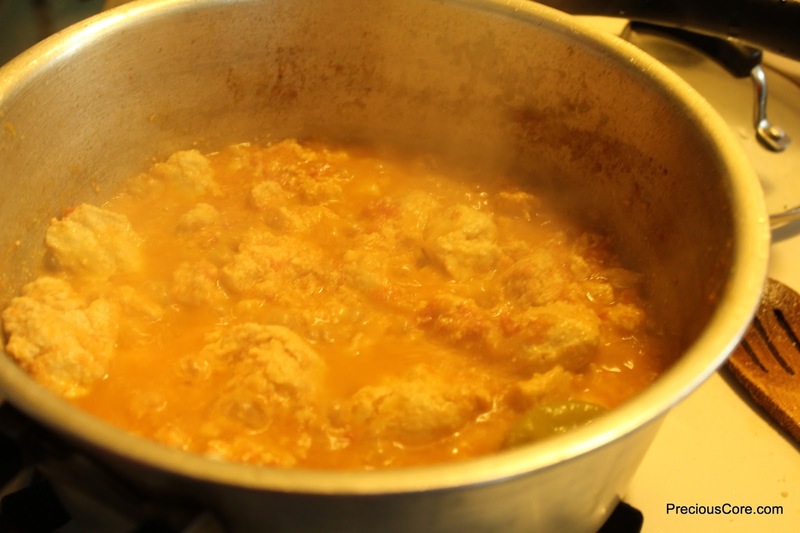 Add a cup of water to the pot and let it boil (If you are using boiled meat, you’ll have to add the stock of the meat here instead). Then add in your egusi in scoops. Let all of that cook together until the egusi is done. It will take about 10 minutes. If the liquid evaporates, you could add about a quarter cup more to keep it moist. Next, add in the vegetable. Add fish or meat and mix everything together until they are beautifully in love. Let that simmer together for five minutes. At this point, it is okay to taste, to make sure seasoning is perfect. 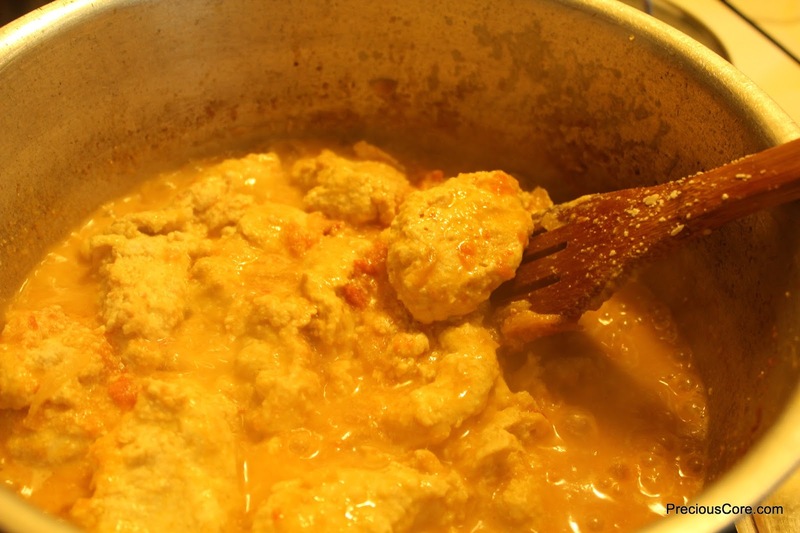 At this point, it is okay to make yourself some fufu or boiled/fried ripe plantains or whoreva. At this point, it is okay to scream, “Njama Njama! Njama Njama!” like my friend’s daughter. 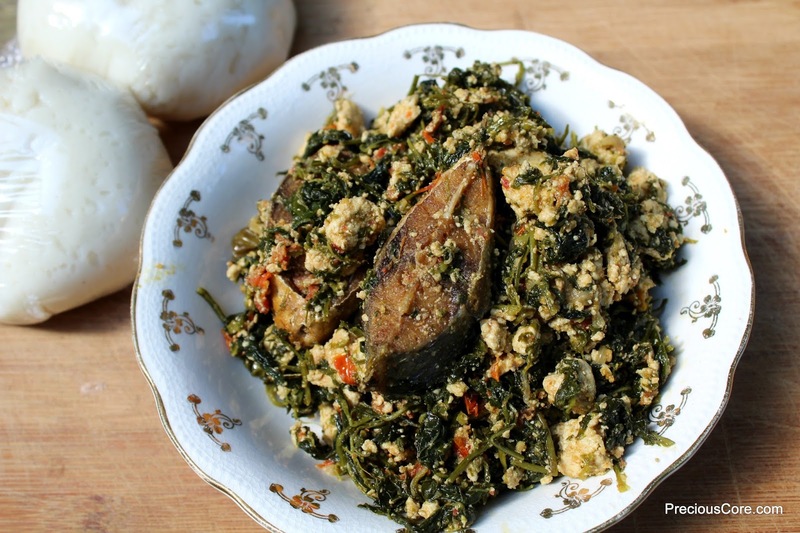 It looks so much like the vegetable called "shoko" here in Nigeria.I'm sure it was very delicious. I've never heard of "shoko" but it could possibly be the same thing. Our meals are so similar. 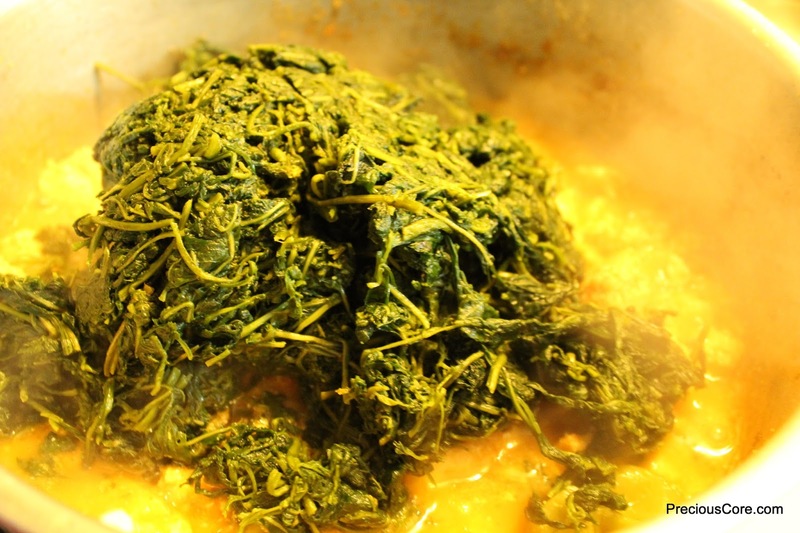 To eat with fufu corn, my mum also prepares similiar with sweet aka banyangi bitter leaves. Delicious for real. Camer is truly blessed with food and cuisine variety. Love it when kids make happy noises when eating. Thanks for being a sista to another JJC sista. 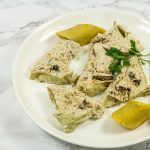 My banyangi aunt once prepared the one with bitterleaf. I woke up in the night for a second serving. No jokes! The chop sweet no bi lie. Thanks for being so supportive, sis! 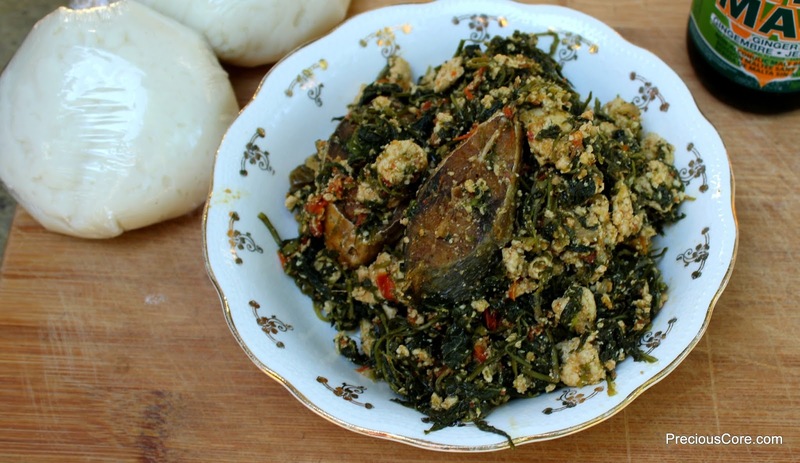 I love trying new recipes from all over and I want to try this one but, what exactly is Egusi? I am Kenyan and have no idea. Hi Patricia, glad to have you here!